I find it pretty hard to come up with ideas for a fifth grade boy for Valentines. 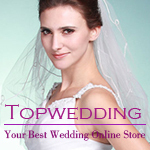 You don’t want it to be too cheesy and young, or too twee, but you still want it to be something clever and memorable. What to do? We went though some ideas this year and finally landed on the scratch off riddle as our winner. I saw a lot of tutorials on Pinterest, but either I’m not doing it right or these tutorials are less-than-honest about their efficacy. Can you imagine? A DIY that doesn’t quite work right on Pinterest? We found a clever little riddle online that has a short answer that fits easily under a scratch off area. Have you figured it out yet? If you like these, I’m putting the PDF up here so you can use them for you own Valentines. I thought it was just cute enough and not too dorky. I have a few pieces of advice for you when making a scratch off card. Many of the instructions you’ll find on Pinterest don’t really give you all the details. The basic instructions are to mix 2 parts acrylic paint with 1 part dish soap, and then paint that over whatever you want to be revealed when the scratching begins. Some tutorials do recommend either laminating the surface or putting down some clear contact paper, and this step really is a MUST. Here’s how I did it. 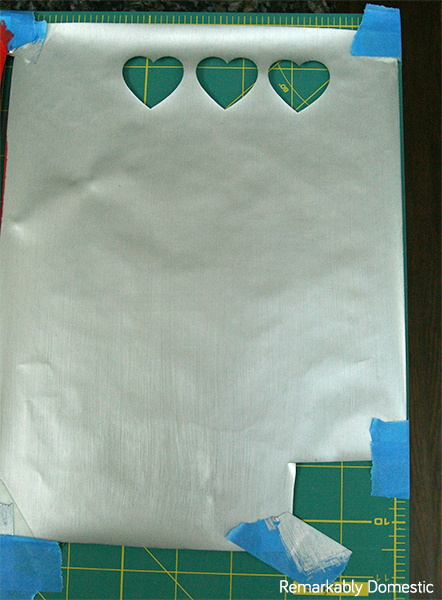 I cut a piece of clear Contact paper to about 8″ x 11″ size. I taped it down to a surface so it wouldn’t curl, and then I painted the whole thing with the paint/dish soap mixture. I let it dry, and then I painted it again. And then I let it dry, and I painted it again. Most instructions will tell you you’ll probably need 2 coats; I found that you really need 3 or ideally, 4. I suppose it depends on the opacity of your paint, but I used both silver and red and with the dish soap mixed in, 4 coats was really necessary to cover the image. After painting and drying several coats, my sheet was ready. Luckily, I have a Silhouette, so I simply created a page full of heart shapes and sent my paper through the Silhouette, painted side down. If you don’t have a cutting machine, you can cut the shapes by hand. If you have a lot of Valentines to make, I’d recommend simply using a square or a rectangle and cutting with a paper cutter. Here you can see my painted piece of Contact paper, with a few test cuts I made with the Silhouette. 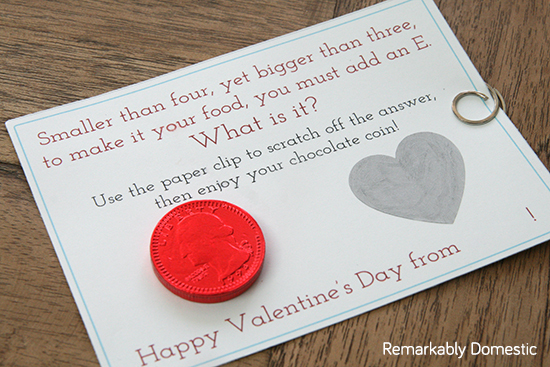 Once you’ve printed out and trimmed your Valentines, simply peel and stick the pieces of painted Contact paper over the answer to the riddle. I then added a chocolate coin as a treat to the front. 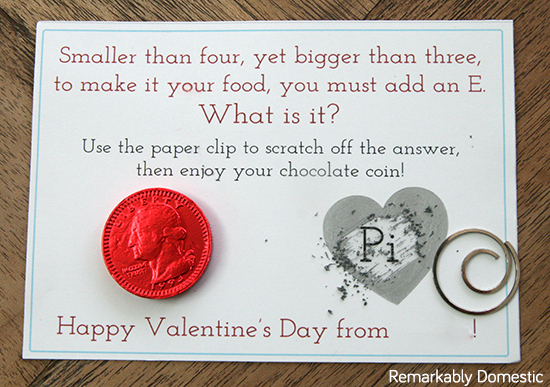 Now, the reason I chose the chocolate coin was because some Pinterest tutorial said you could scratch off with this chocolate coin. Wouldn’t that be sweet? Yeah, doesn’t work. This formula for making scratchable areas is sufficient, but you have to scratch pretty hard to get the paint off. A piece of chocolate is neither hard enough nor sharp enough to get the job done. That’s why I ended up adding a paper clip to the Valentine for scratching purposes. I tried several varieties, because I wanted it to be a cute paper clip, but only the metal ones worked, and even then you still have to scratch pretty hard. So that’s it! It was pretty simple to create, and if you can get past the fact that this scratching mechanism isn’t perfect, I think it makes for a cute Valentine. 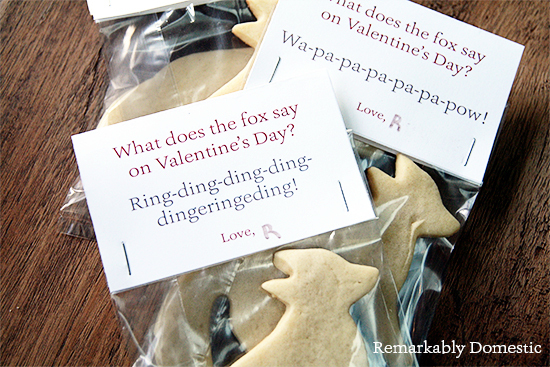 What Does the Fox Say on Valentine’s Day? The 7 year old and I kind of decided together that this year, the valentines would be Ylvis-themed. 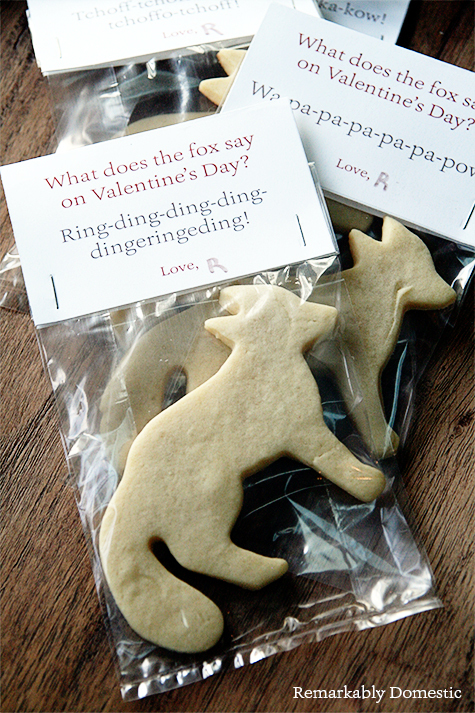 People, the fox does NOT SAY happy Valentine’s Day. He says “Wa-pa-pa-pa-pa-pa-pow!” and “Fraka-kaka-kaka-kaka-kow!” and “Ring-ding-ding-ding-dingeringeding!” Amiright? I mean, the whole joke lies in the crazy sounds that the Norwegian duo came up with for the fox. So, you kinda gotta keep that in there. I made my own printable that makes sure the joke is still conveyed. And if you like it and want to use it, you can download the PDF right here! 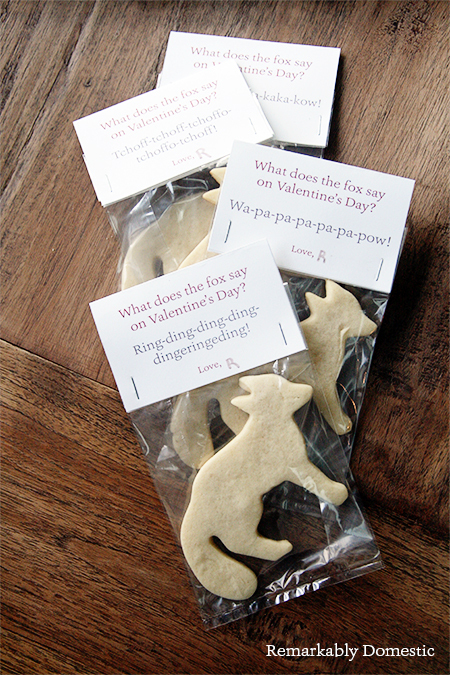 To make these valentines, you’ll need a fox cookie cutter, and I was so happy to discover that you can get them in a set of woodland animal pastry cutters at IKEA. You can also order them from Amazon if you don’t have an IKEA around you. And bonus, you also get a moose cookie cutter and what I think might be a snail? So, bake your cookies. 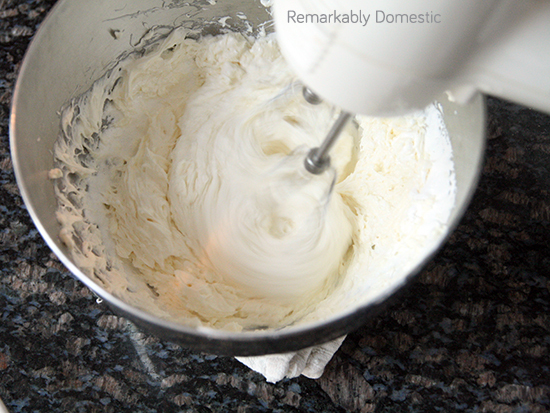 I used this recipe, but you could pretty much use any sugar cookie recipe if you have a favorite. 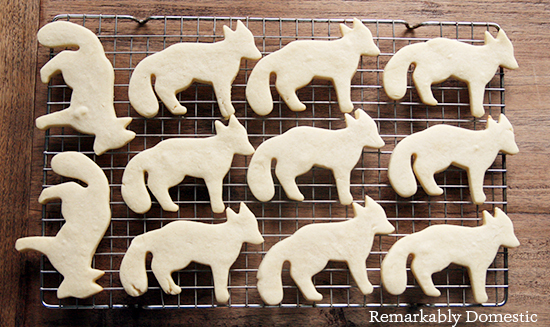 The key to making sure your foxes turn out right is to make sure the cookies are very chilled when you stick them in the oven. Roll the dough out chilled, and I even recommend putting the cookie sheet with the cut-out cookies back in the fridge for 30 minutes or so before you bake them. Then you won’t get too much spreading. You’ll need some treat bags that fit your cookies; I bought some like these that work perfectly. I made a PDF sheet of labels that, again, you can get here; it has 4 labels, each one with a different fox “sound.” Print out a page on cardstock and then cut them along the light gray solid lines. For each label, you will fold them in half along the light gray dotted line. I left a space at the bottom where you can have you child sign the valentine. 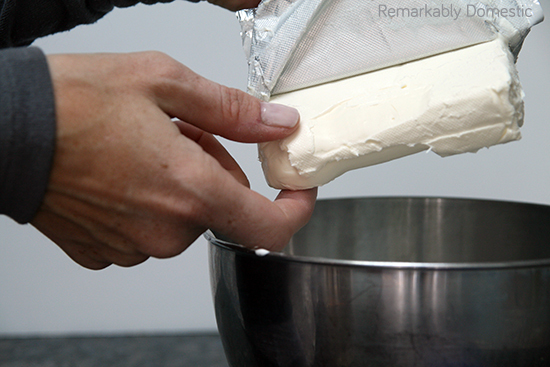 Put a cookie in a bag, fold down the top, and slide the fold into the label. Staple on either side to secure them. And then have a fabulous Valentine’s Day! Coming up next are the 10 year old’s valentines, so stay tuned! 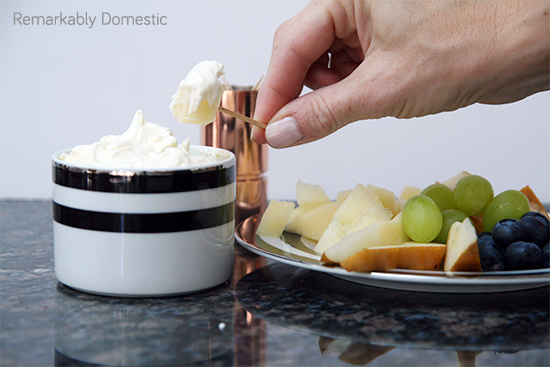 I am not kidding you, this appetizer is so ridiculously easy to make. It takes about 3 minutes. The hardest part is cutting up the fruit. 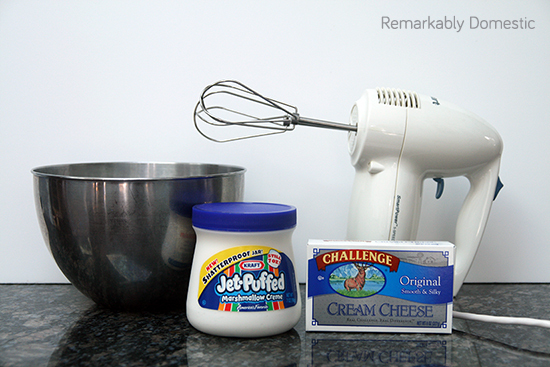 You might be able to make it without an electric beater, but you’d have to have a lot of arm strength. 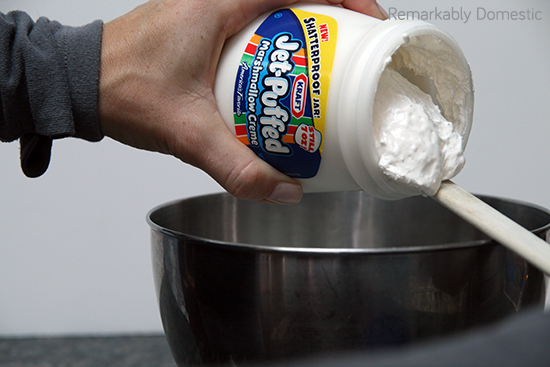 So, you get these two things, and you put the entire jar of marshmallow creme and the entire block of cream cheese into a bowl. And then you blend it. 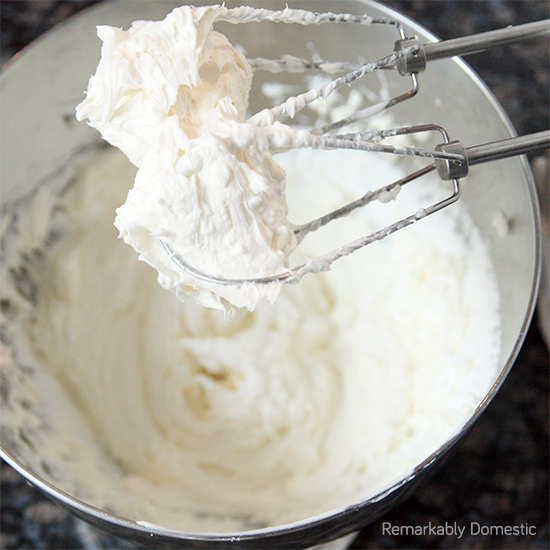 I’d say the blending take about two minutes; use a high speed, and be sure to scrape the sides with a spatula because the marshmallow really wants to stick to the side. And then? YOU’RE DONE. You can serve it in a nice bowl with a platter of fruit. 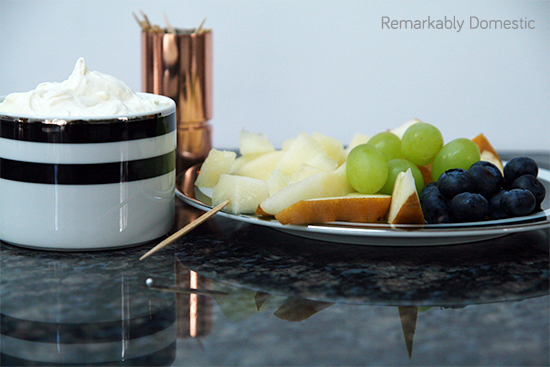 You can either cut the fruit into small chunks and provide toothpicks (my preferred method, since you then get a larger dip to surface area ratio, and you don’t have to worry about double dipping), or you can cut fruit into slices that people can pick up. Look, I didn’t say it was the healthiest Super Bowl appetizer ever, but what Super Bowl food really is that healthy? 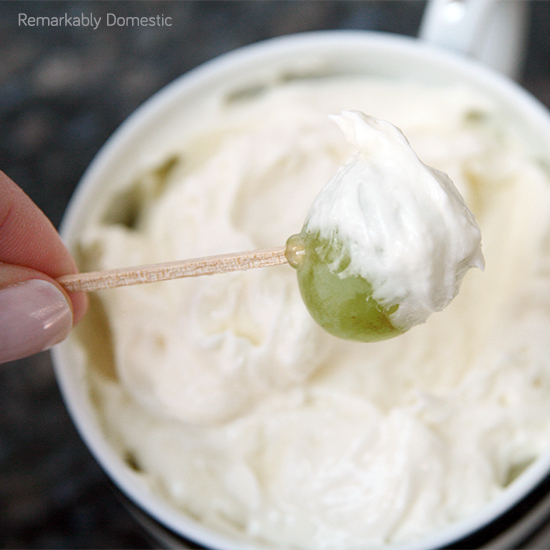 Kids love this dip, almost as much as I do. Who are you rooting for in the Super Bowl? We don’t care about professional sports in this house, but somehow both my kids are Broncos fans. Or, more accurately, they are going to root for the Broncos in the Super Bowl. They are really barely aware that it’s a team. So don’t hold it against them. I was at the hardware store some weeks ago, and I saw all these weird components that seemed like they could come together into some pretty cool jewelry. So I wanted to give you all a little series where I make different pieces from things found in the hardware store. It’s fun, right? 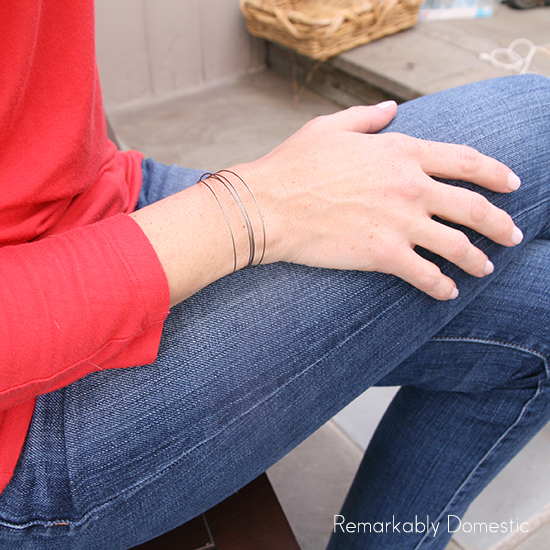 First up is my delicate wire bracelet. 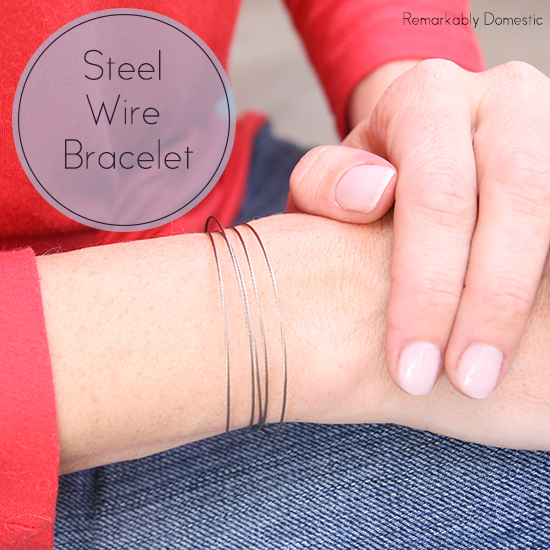 There are a bunch of different gauges of this galvanized, twisted wire available at your local hardware store, and it’s super inexpensive. Mine was about $0.39 a foot. 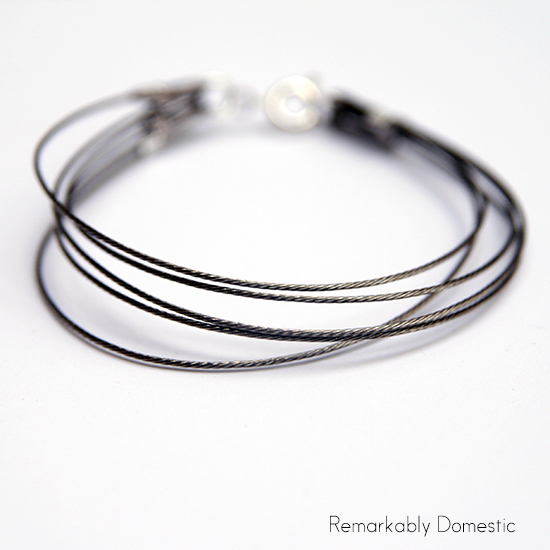 I liked the thin wire and thought it would look cool with several rounds of it stacked together. Here we go! 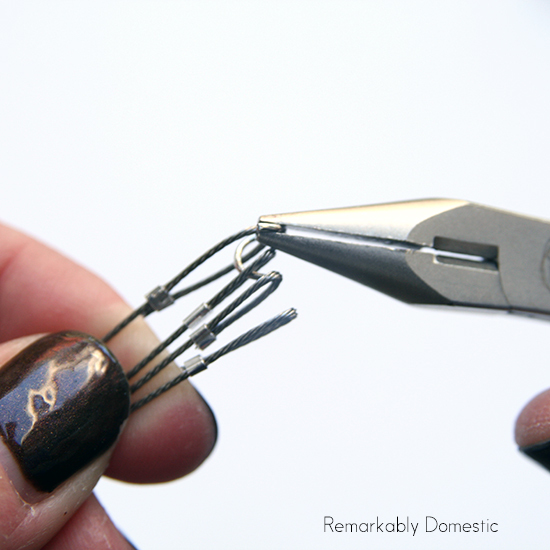 To start, cut your wire into appropriate lengths. 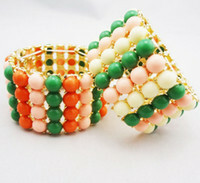 This bracelet looks best when it’s relatively tight around your wrist. Keep in mind that you are going to be folding about ½ inch of each end over. I cut mine to about 8″, and I wanted 5 strands. 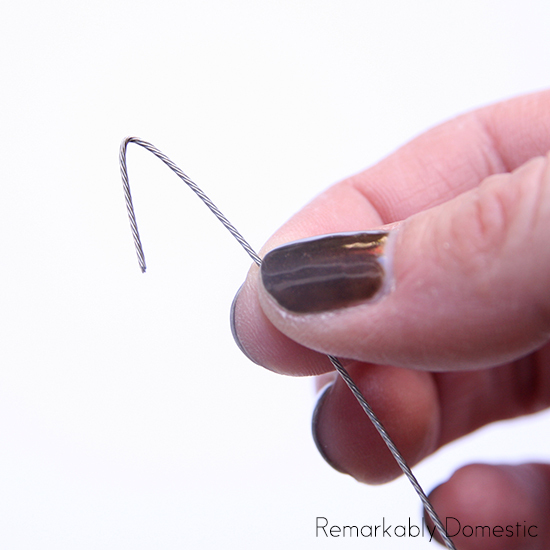 Take a strand of wire and bend about ½ inch over. It’ll take a little muscle since this is pretty strong wire. 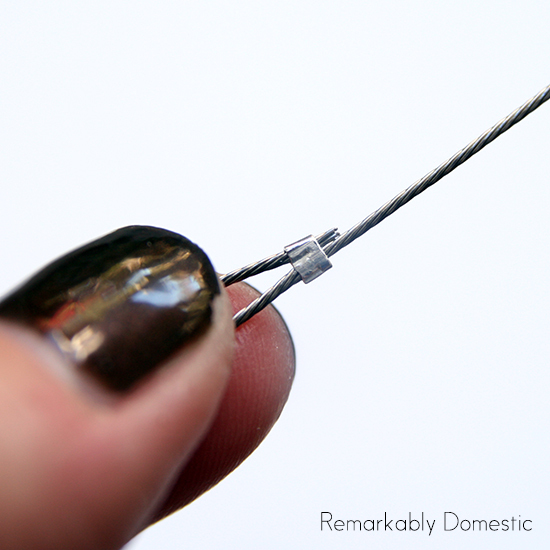 Slide a crimp tube onto the wire from the other end and move it up towards the bent end. This is the hardest part: getting the crimp tube to slide over the main wire and the end of the bent section. 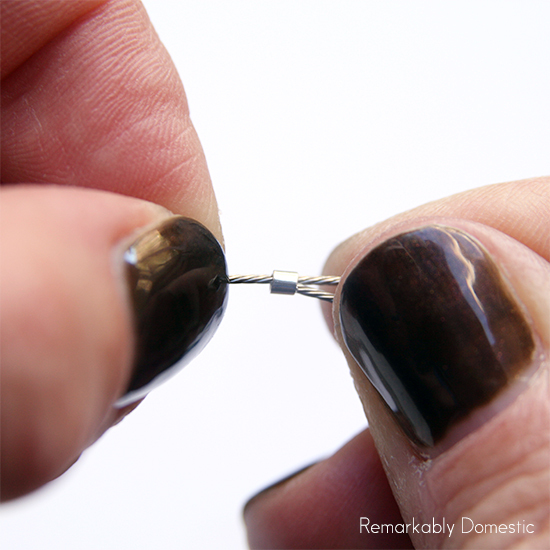 You’ll have to squeeze the bend so you can get the end of the wire as flush with the body of the wire as possible. Slide the tube up so it sits over the end of the wire. 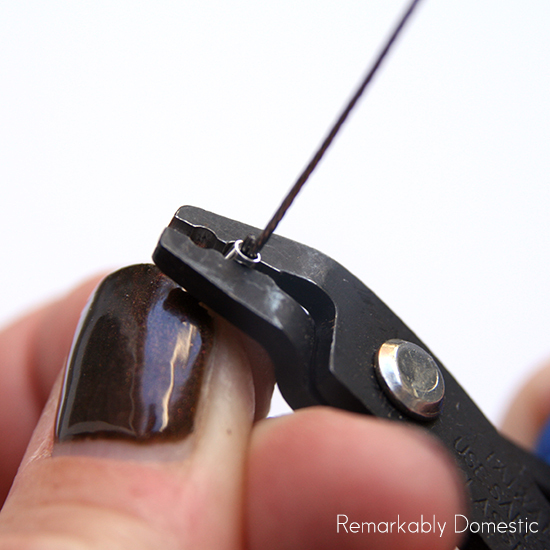 Carefully crimp the tube with pliers or a crimper. 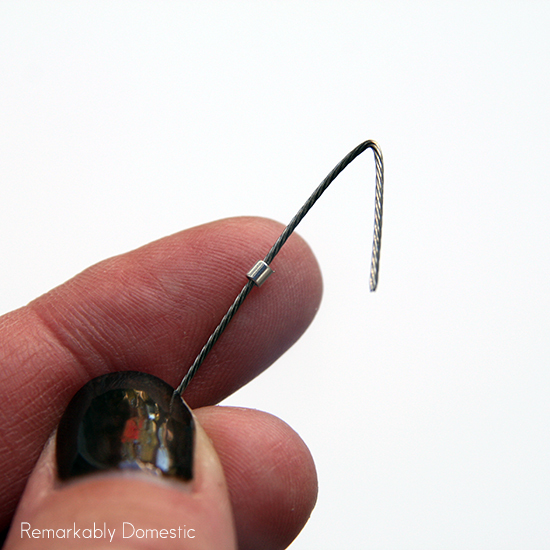 Repeat the process for the other end, but this time you’ll need to slide the crimp tube on before you start bending the wire. Once you’re done, you’ll have a wire with two loops on either end. 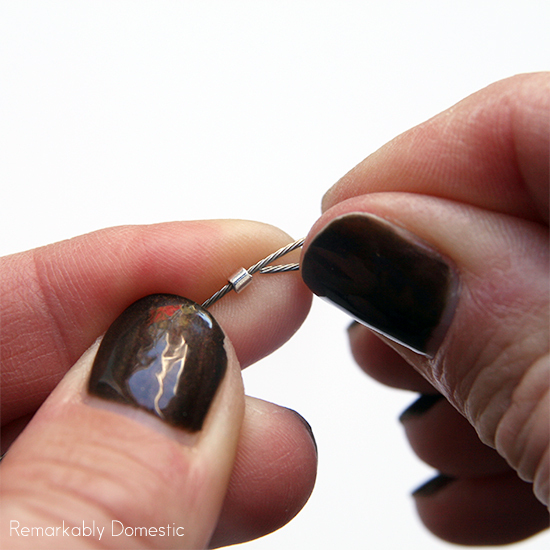 Repeat the entire process for all your wires. Now, gather up your wires and connect all of the ends together with a jump ring. Once you’ve connected one end, you can connect the others with a jump ring; be careful to keep the wires in the same order. 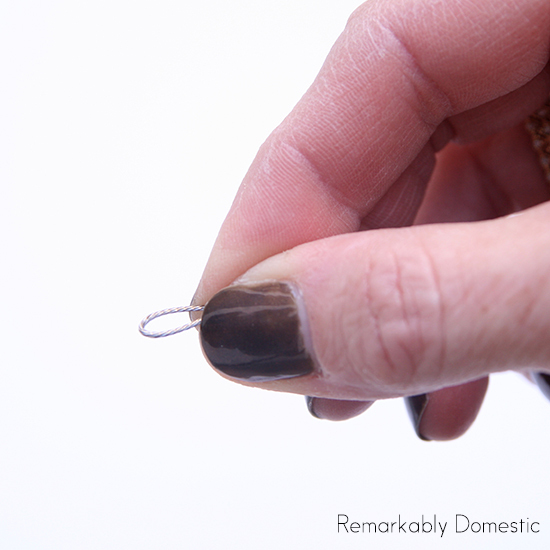 Attach a clasp to one end, and then close the clasp. 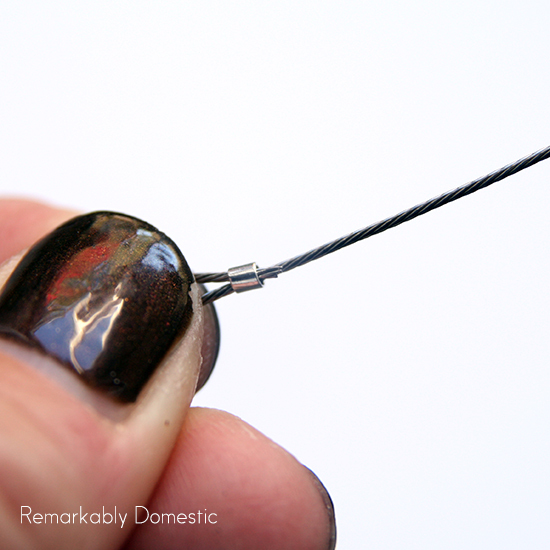 Using your hands, mold the wire a bit so that it’s slightly more rounded. And you’re done! 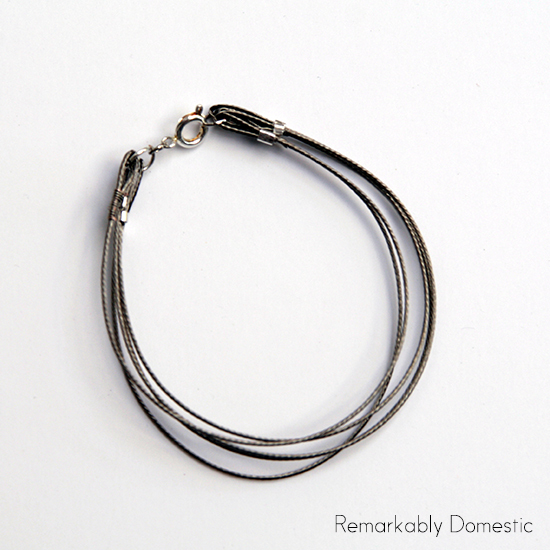 Simple, inexpensive, and I love the delicate look it gives.